I departed Denali National Park yesterday about noon and drove 12 hours to Tok on my way back to the Yukon, British Columbia, Alberta and the Lower 48. I hope to see bison today and maybe some more moose. 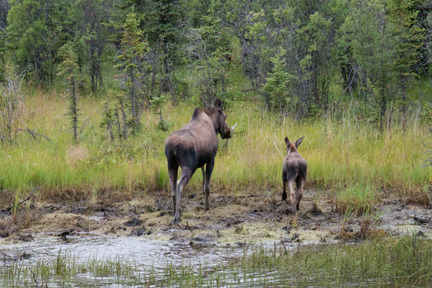 Last night at about 9pm I was about two hours from Tok when I spotted a moose cow and her calve in a small pond beside the road. I did a U-turn and when back and passed the location. Did another U-turn to put the moose on the driver’s side of the truck and crossed to the shoulder going the wrong way on the highway. There was almost no traffic and I wasn’t worried about being hit. 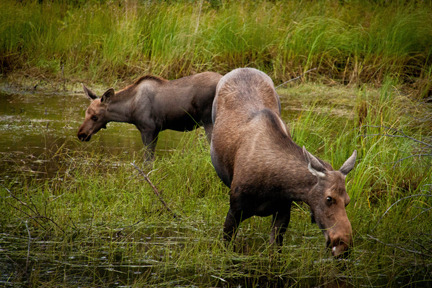 I put my window down and got my camera ready before pulling up the the moose’s location. Here’s what I got. Moose rump! They took off for the trees. So I decided to add a new tool to my photographic arsenal…patience. I went up the road 100 yards and turned around again and came back to the spot they had previously been at. I put down my passenger window, turned off the truck and waited. The shot above was taken at 9:03 pm. This one was taken at 9:24 pm. They came back. I sat there for about 10 minutes watching them eat. They eventually moved apart. When I started up the truck to leave the noise sent them back into the trees but I imagine after I was down the road a ways, they were back at their watering hole.In my last blog, I showed you a picture of Mt. McKinley at sunrise on Saturday. I like to tell you a little about Mt. McKinley and show you some additional pictures.